When Should You Visit Urgent Care For Flu Symptoms? When Should You Visit Your Local Urgent Care For Flu Symptoms? The flu is extremely common and can strike at any time in life, but there are certain signs that indicate your flu symptoms are serious enough to require medical attention. In most cases symptoms of the flu are not serious and you will recover on your own with plenty of rest and hydration. Even if you are only experiencing mild to moderate symptoms of the flu you should still remain isolated from other people until you’re feeling better. The CDC recommends staying home for at least 24 hours after your fever subsides. The only exception should be if you are leaving the house to seek medical attention. If you are in a high-risk group you may want to visit your doctor to ensure you are okay even if it seems like a regular flu. High-risk populations include young children, anyone over 65, pregnant women, and anyone with a preexisting condition such as diabetes, AIDS, HIV, cancer, or any other chronic condition that weakens your immune system. Can You Treat The Flu With Medicine? If your flu symptoms are on the more serious side you may need antiviral drugs prescribed by a doctor. Antiviral drugs will speed up the recovery process by helping your body fight off the infection. They may also reduce the risk of further complications associated with the flu such as dehydration or bronchitis. If a doctor does not prescribe antiviral drugs you can help reduce discomfort by taking over the counter medicines like Tylenol. When Should You Go To Urgent Car For The Flu? You should visit urgent care if you feel like you are not getting better or if you are unsure if it’s the flu you are experiencing. If there is an outbreak of the flu in your area your doctor will know and may able to prescribe something to help. Your flu symptoms seem to be dragging on and not getting better. Symptoms seem unfamiliar compared to other flus you’ve had in the past. You have a persistent fever. A high fever varies depending on age; children are better able to tolerate a high fever compared to adults. For instance, a 102-degree temperature as an adult is considered on the high side. You are losing a lot of fluids, and/or unable to keep fluids down. Dehydration is a leading complication related to the flu. If you don’t take in enough water when you are sick you are going to get dehydrated fast. Dehydration will slow your recovery and create additional problems. If you are experiencing difficultly keeping fluids down you should visit a doctor. A clear sign you are dehydrated is if you are urinating less often than usual. There are a number of further complications that can result from the flu. The most common is pneumonia, which is especially common amongst elderly populations, as well as those with underlying conditions or risk factors. Bronchitis can also be spurred on by the flu, as well as ear infections and sinus infections. If you have congestive heart failure this may become complicated due to the common flu. You can prevent a domino effect from happening by visiting your local urgent care sooner rather than later. In some cases your symptoms are too severe to be treated at Urgent Medical Center and instead require emergency attention. The emergency room costs more than urgent care and it may take several hours to be seen by a doctor, but in more serious cases it’s a necessary decision. Here are some of the symptoms that may indicate the need to go to your local emergency room as soon as possible. Skin or lips are a bluish-hue. Child is breathing fast or having troubles breathing all together. Child is not waking up. Child is not interacting properly. Child is so irritable they resist being held. They have a fever that comes with a rash. Flu-symptoms start to improve before coming back with a fever and worse cough. No tears present when crying. Unable to eat, complete lack of appetite. Having troubles breathing or feeling short of breath. Uncomfortable pressure or pain in chest or abdomen. 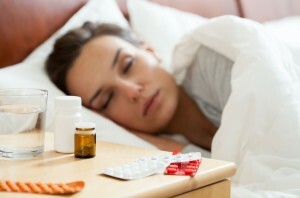 Flu-like symptoms get better before returning with fever and increasingly bad cough. The best way to prevent the flu is to get the flu shot ahead of sick season. Stop by your local Urgent Medical Center today to get your flu shot, or for flu-related treatment.